Based on pickups from Sean Costello's '53 Goldtop that he sent to Jason Lollar to copy, these dog ear P-90s are coupled with weak magnets to produce lower output, a delicate attack, and less midrange and bass. 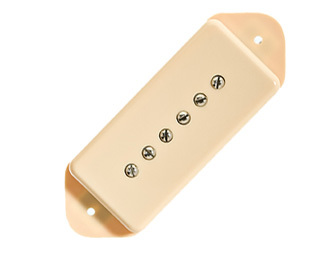 This produces a brighter overall tone with less grinding distortion. It's also slower to overdrive an amp as compared with stock P-90s. An excellent choice for players seeking an early Freddie King style tone. Includes de-gaussed Alnico 2 magnets. Available in black, cream, or white. 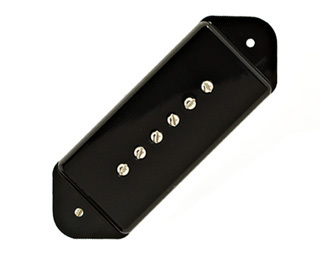 You can also purchase a Shim Pack for Dog Ear pickups, which contains the six most commonly used shims. These can also be stacked for optimal height. Above soundfiles played by Greg Timmons with a Fender Brown Vibrolux and a Lollar SG. The Epiphone Casino is such a cool guitar, except for the fact that the pickups are wound WAY too hot (12 k) for a hollow body guitar. I replaced the stock pickups with Lollar 50's wind dogears w/plastic covers. It's a different guitar. Now I can chase that Grant Green tone.